A lawyer for Marion "Suge" Knight said his client was behind the wheel in a fatal crash, but called it a "tragic accident." Death Row Records founder Marion "Suge" Knight was arrested on suspicion of murder after his lawyer confirmed the hip hop mogul was behind the wheel of a car that fatally struck a man in Compton. James Blatt said Knight accidentally ran over and killed a friend and injured another man on Thursday as he fled attackers. "He was in the process of being physically assaulted by two men and in an effort to escape he unfortunately hit two (other) individuals," the lawyer told The Associated Press. "He was in his car trying to escape." The Los Angeles County Sheriff's Department confirmed to NBC News Friday morning that Knight had been arrested on suspicion of murder in connection with the crash. He is being held on $2 million bail. Knight, smoking a cigar arrived at the West Hollywood LA Sheriff's Station to surrender early Friday morning. 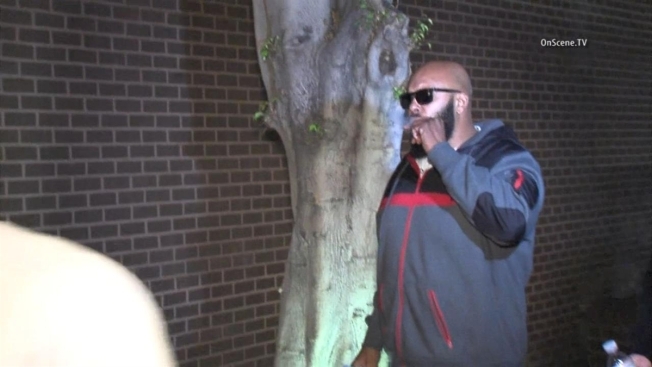 Marion "Suge" Knight remained in jail on suspicion of murder Friday afternoon following a fatal crash in Compton. Toni Guinyard reports for the NBC4 News at Noon on Friday Jan. 30, 2015. He did not comment when asked about the allegations. His attorney said he would not be making a statement. Lt. John Corina, of the LA County Sheriff's Homicide Bureau said it looked like the person at the wheel "drove backwards, struck victims, then went forward and struck them again as he left." The victims, ages 51 and 55, argued with Knight earlier at a shoot for the new "Straight Outta Compton" movie, authorities said. The deceased victim was identified Friday morning as 55-year-old Terry Carter. Witnesses told investigators that Knight, the onetime head of Death Row Records, was in the vehicle during the 2:55 p.m. incident on Rosecrans Avenue. But authorities were still trying to sort out whether Knight was the driver or a passenger. Blatt called it a "tragic accident," and is confident Knight will be cleared of wrongdoing. Authorities said a vehicle drove into a crowd on a sidewalk, hours after the video shoot, and struck the two victims. The incident is being investigated as a homicide. The identities of the victims were not immediately released. Sheriff's officials confirmed that another police agency found the red pickup truck that fled the crash, parked in an unknown condition in Westwood. NBCNews' Andrew Blankstein and the Associated Press contributed to this report.